Hello to everyone out there in the blogosphere! Welcome to another classic restaurant review on Mastication Monologues. Yesterday, I visited a restaurant in Chicago that is an institution and a symbol of German-American pride in the city. 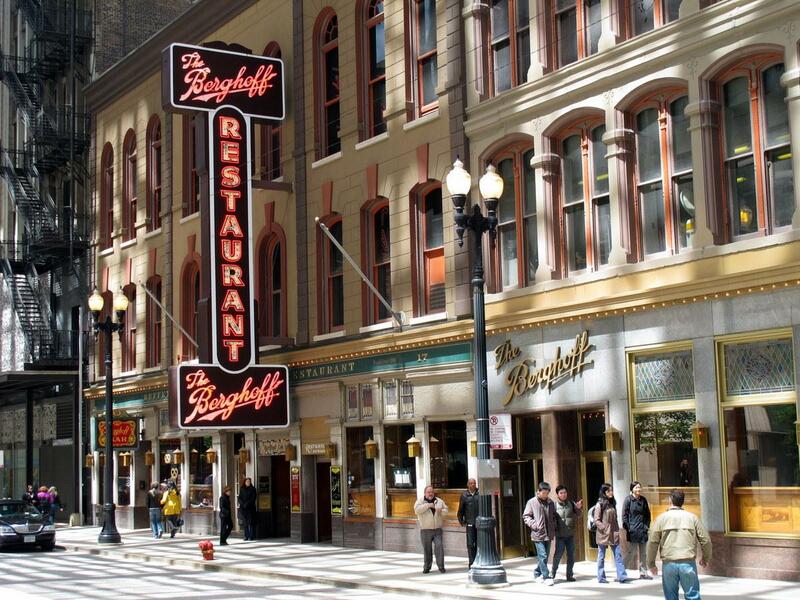 It is called The Berghoff Restaurant and is located at 17 West Adams Street Chicago, IL 60603. In the current landscape of restaurants in America, it seems that there is a huge demand for food that is cutting edge in terms of taste, preparation, and presentation. Unfortunately, it has come at the expense of the classic ethnic establishments that serve old-world comfort food that may not win any beauty contests, but like Shallow Hal, diners (hopefully) realize that the beauty of these dishes lies within their heartiness, fresh ingredients, and simplicity. The Berghoff has been in operation since 1898, and as soon as you walk through their stained glass doors you can just feel the history emanating from their rich Mahogany walls. This connection to the past and traditions is reflected in their menu as it contains many German food staples, and there are other options for those who are not looking to get their Wienerschnitzel on (burgers, sandwiches, salads, and even Tandoori chicken). I, however, decided to say guten tag to their slow braised drunken ox joints, and I plumped for their Oktoberfest beer to drink since it was on special. While we were waiting, they provided us with a free bread basket that was great since it contained fresh artisan white bread, rye bread, and a baked flat-bread that had cheese baked into it. Based off of taste, it probably was Parmesan. When my ox joints came out, it was tastefully displaced like a mighty meat monarch who sported a crown of sautéed julienned onions and was surrounded by his pumpkin gnocchi minions who were kowtowing to their ruler. I didn’t waste time tucking into the ox joint, and it was an interesting experience. First, there was a good amount of fat on one side of the meat which I didn’t mind, but it was quite hard to hold the bone in one place while trying to take the meat off. Thankfully, the meat was tender and literally falling off the bone which made my job a lot easier. The meat was covered in a Berghoff bourbon sauce that was like some sort of magical ambrosia that made the beef even more succulent with each bite. However, after working like an archeologist on the joint, I found out that I was eating meat off of a vertebrae, not a joint. I don’t know if this is a ploy to give you less meat, but it left me disappointed since a majority of my meal was bone. Underneath the hockey puck of meat there was a delicate blanket of sautéed Swiss chard that provided a rich, spinachy bite to the savory beef. 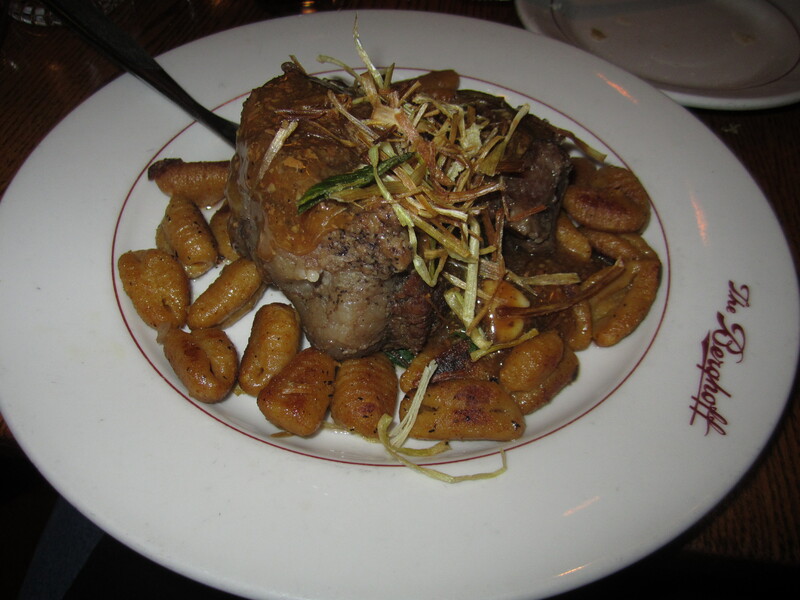 The gnocchi were the most interesting part since they were lightly fried, firm, and had a slight pumpkin aftertaste. Now, I know during Fall people go pumpkin-flavored product crazy, but I definitely don’t fall into that category. Regardless of my leanings, the fact that the dumplings didn’t overwhelm me with pumpkintastic flavors left me a happy diner. My Oktoberfest beer was definitely not for the weak stomached since it is similar to the Marzenstyle beers that they serve at the world-famous harvest festival in Germany. Its reddish-brown hue contained a moderate bitterness that was then followed by a hop aftertaste that left me blown away at its boldness. 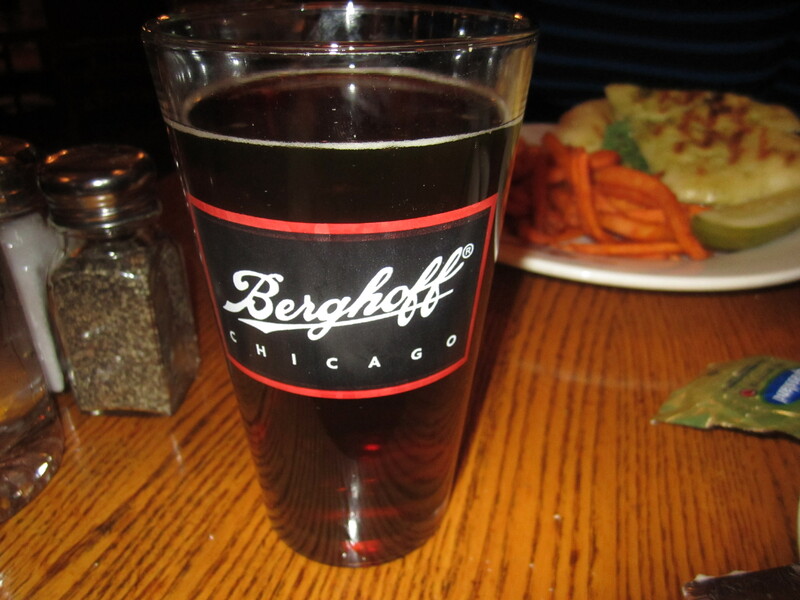 So if you’re looking for eine kleine piece of Deutchland in Chicago, head down to the Berghoff Restaurant.